First, Click on "Inventory," then "Inventory Orders" and then "InTouch Import." 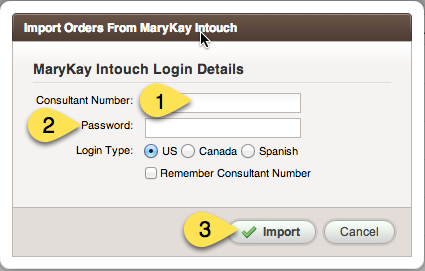 When you click InTouch Import, you will be given a little box in which to enter your login information to InTouch. You will use your "Consultant Number" and "password" you use to log in to InTouch, not Pink Office. I like to check the box that says "Remember Consultant Number." That way in the future you can just enter your password. 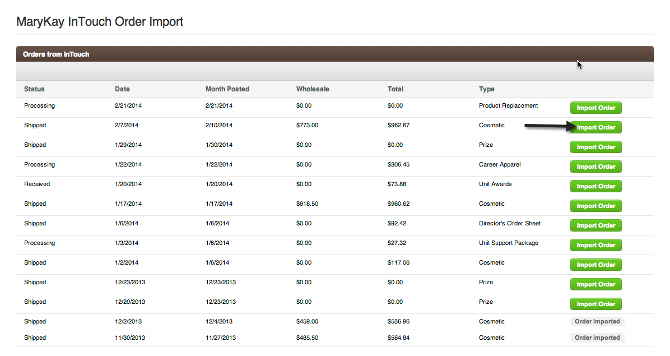 Next you will be give a screen that shows all the orders you can import from InTouch. These are orders have been placed and paid for on your InTouch account. Click the green "Import Order" button of the order you would like to add to your inventory. Check your totals, if you need to edit something click "revert to draft" in the far upper right corner, be sure to click "Create order and Marked Shipped" when you are finished.